The Blue Raiders’ roster and coaching staff took diverse paths to get to the team but united to pull off one of the NCAA tournament's most incredible upsets ever. ST. LOUIS — There had been and-ones and daggers, circus layups and wiggled hips. But it was not until there was a hair under 40 seconds left on the clock that the game between Middle Tennessee and Michigan State would get its exclamation point. It came from a Blue Raiders junior forward who spent high school dreaming of SEC football stardom and had now spent an afternoon thwarting the dreams of a Big Ten basketball powerhouse. Reggie Upshaw stood unguarded on the baseline as his Middle Tennessee teammates broke the Spartans' press after a turnover and then caught a short pass from teammate Darnell Harris. Michigan State forward Colby Wollenman closed quickly, colliding with Upshaw as he rose for a two-handed dunk that increased his team’s lead to seven. A referee blew his whistle, signifying Wollenman’s foul, and Upshaw swayed from the rim, clinging with his right hand. He grimaced, darting his tongue from his mouth. He mean-mugged toward the cluster of Blue Raiders friends and family erupting in the nearby stands. He lifted both arms to flex his biceps, then held the pose and turned around to face the arena’s other side, so that no one would miss the gesture. It was a statement that would have been unbelievable only a few hours before. Michigan State had entered the tournament as a popular national title pick, held in such high regard that many considered the Spartans to have been underseeded as a No. 2. They were led by diversely talented star senior guard Denzel Valentine, who was recently named Sports Illustrated's national player of the year, and who just this week was declared the country’s best player by President Barack Obama. Their coach, a finalist this year for the Hall of Fame, has made a career of producing teams that are known not only for their toughness and defense but also—perhaps even more so— for their success in the NCAA tournament. Just last season Izzo had coached a team seeded No. 7 in the East Regional to his seventh career Final Four, five years after getting there as a No. 5 seed. In 18 tournament appearances, his teams had lost their first game just four times, and never as a top-four seed. Middle Tennessee entered anonymously as champions of a declining Conference USA, with its best wins having come against Old Dominion and Toledo. The Blue Raiders had not won an NCAA tournament game since 1989—well before any of their current players were born—and had appeared just once since then, in 2013, when they lost to St. Mary’s in a First Four game. When this year's players set goals for the team, they talked about being like that 2012-13 squad, or a little bit better. They were not coached by a living college hoops deity but instead by a onetime wunderkind who flamed out spectacularly only to claw his way back. Kermit Davis Jr. practically grew up on the bench, the son of the head man with the same name at Mississippi State in the 1970s. When Kermit Jr. finished playing guard for the Bulldogs in ‘82 he graduated into an assistant coaching job. By 28 he was the head coach at Idaho, which he led to two NCAA tournaments (1987 and ’88) in his first two years before leaving for Texas A&M. There he lasted just one season, going 8–21 and being implicated in a scandal in which a recruit was provided impermissible benefits. He was hired as an assistant at Chipola (Junior) College in Marianna, Fla., rose to the head job, headed back to Idaho for a year, then spent five years (1997-98 to 2001-02) as an assistant under then-LSU coach John Brady. Middle Tennessee hired him as its head coach in 2002. Fourteen years later the players at his disposal had traveled similarly circuitous routes. His starting center, Harris, began his collegiate career at Division III Wisconsin-Whitewater, then transferred (somewhat hesitantly, given his enjoyment of D-III) to play juco ball at Northwest Florida State before Davis recruited him as a pick-and-pop threat. Upshaw, the team’s leading rebounder and the son of a former Blue Raiders defensive lineman, drew interest from Vanderbilt and Tennessee as a tight end before breaking his ankle and giving up the gridiron. And then there was leading scorer Giddy Potts, with a name and skill (his 50.3% three-point shooting ranks first nationally) so suited for March darlinghood it felt a bit too on-the-nose. Giddy’s nickname practically followed him into this world—it originated from a nurse remarking upon his mother’s unbridled post-birth joy—but his shooting touch developed only after spending his early high school years banging as a 6’2” post player. Davis gushed about his potential and Potts believed him. Now, Potts said, “I’m the best shooter in the country." The Blue Raiders finished second in their conference this year, then lost valued defender and beloved sixth man, sophomore guard Edward Simpson, before the Conference USA quarterfinals, when he broke his right fibula and tore two ankle ligaments during a five-on-five transition drill. His teammates laid on the court with him until an ambulance arrived, then promised to win the conference tournament in his honor. When they did, Simpson delayed his scheduled surgery and bought a scooter so that he could accompany them to St. Louis, where he hobbled into team huddles, his heavily wrapped right foot jutting out behind him with a white sock bunched on his toes like a snow cap. He cared little about the inconvenience of getting around. He had to be a part of what came next. Simpson could not resist the trip’s novelty, but the Blue Raiders did not believe that was all their trip had to offer. When their draw came out on Sunday night, their reaction was twofold. First there was the matter of being seeded 15th. “We felt disrespected,” said junior forward Aldonis Foote. Then there was their opponent, Michigan State, which offered them an opportunity to bust brackets that they could not ignore. In the four-day lead-up to the game they did not look to past No. 15 successes—most memorably Florida Gulf Coast—for inspiration. Outside of the coaches showing a “One Shining Moment” montage at a team meeting on the eve of the first round, “the main focus was us making our own history,” said Foote. The coaches preached that the Blue Raiders need simply to play the way that they play. The players talked about the matchup problems they could create. They scouted meticulously. “We prepared like there was no tomorrow,” said assistant coach Win Case. “We knew every single thing that they did.” Before Friday’s game, 14 points of emphasis were written on the team’s locker-room whiteboard. Two were circled: GET BACK and HIT 1ST. That they did. The Spartans entered Friday wary of the mix of zone, man, and trapping defenses Middle Tennessee had at its disposal, and through the game’s first five minutes, Michigan State appeared fully flummoxed, scoring just two points, on a layup inside from Deyonta Davis. “It was probably the only team all year that went from 1-3-1 to 2-3 to man,” said Valentine, who finished with 13 points on 5 of 13 shooting from the field and four fouls. 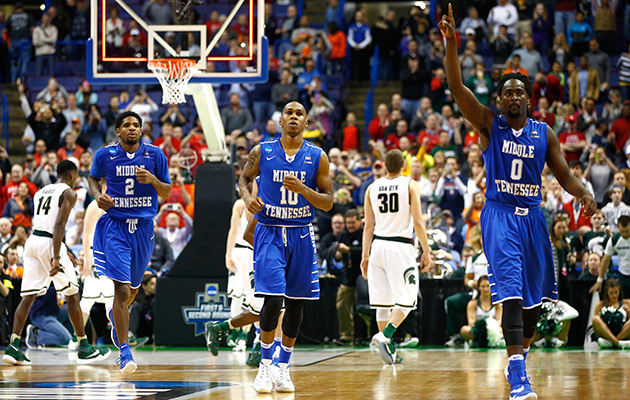 Meanwhile four Blue Raiders combined to score 15 points in opening burst, prompting a flustered Izzo to call timeout. 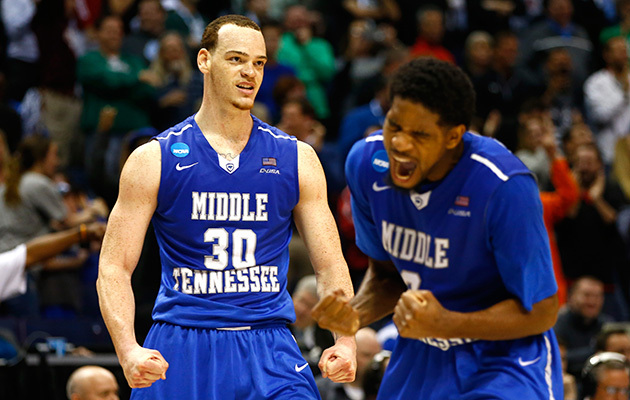 “We weren't scared of the moment,” said senior Blue Raiders swingman Perrin Buford. Even when the Spartans snapped out of their funk, shrinking a 12-point deficit to two at 20-18 with nine minutes left before intermission, the Blue Raiders remained unfazed. They traded buckets. They drove into contact. They scored coolly in the shot clock’s dying seconds. They grabbed 50/50 balls. With 1:21 to play in the half, senior JaQawn Raymond drained a three over Valentine then fell to the floor, drawing a foul. As he stepped to the free-throw line, he thought, This is really happening right now. We’re really up by 10 on Michigan State. “I never would have thought that in a million years,” Raymond said later. Middle Tennessee entered halftime leading 41-35, having made eight of 12 three-pointers. Their supporters buzzed in the stands, more than one asking a variation of the question, “Do you believe this?” Members of the school’s band gawked at the scoreboard, as if expecting the scores to reverse. In the hallway, one of its members fretted that he might lose his job because he had not bothered to have anyone cover his weekend shift. They would not come far enough. When the Spartans cut the lead to three with 5:39 left, Raymond responded with a reverse layup. When it was down to one, Buford extended it with a bucket, then Potts (who scored 19 points) added a jumper with a minute to go. Then came Upshaw’s dunk, which gave him 21 points and pushed the lead to 83–76. Forty seconds later, the Blue Raiders were the eighth No. 15 seed to win a first-round game, the fourth in the last five years, and perhaps the most shocking among the bunch. Their celebration was subdued, bumping chests on the court and pointing to the stands, where their loved ones and fans were again beside themselves. The seven cheerleaders representing the school began to chant, It’s good! To be! From Middle Tennessee! When the Middle Tennessee cheering section lingered in celebration, an usher told them it was time to begin clearing out the stands for the arena’s second session of games. “We ain’t leaving!” came one response. They all believed now. In the locker room they settled quickly. Potts was already talking about Sunday’s matchup with Syracuse and trying to remain on an even keel. “We just made history,” he said. “It's a big deal, but it's not a big deal really.” Around him his teammates clustered around smart phone screens to watch Snapchats and check social media and soak in the instant stardom in the viral age. Simpson, wearing a backward silver Conference USA championship hat, wheeled aimlessly on his scooter, unable to sit still. In a nearby interview room was Davis, their coach, holding court at the postgame media conference. From there he did interviews for TV and radio, staying in the locker room area for nearly a half hour while his team waited on the bus. 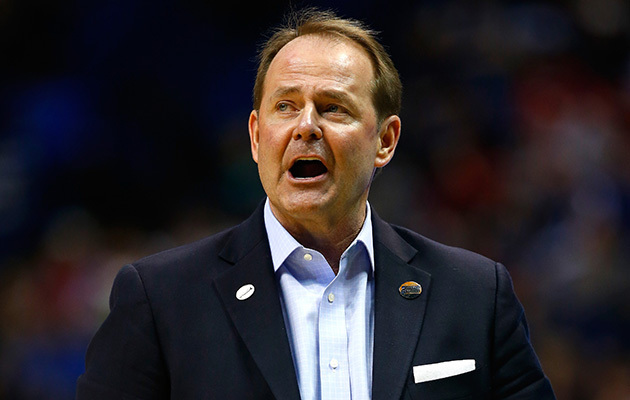 On his way out, as he walked across the court and up the aisles of Scottrade Center’s Section 123, he considered his long road down and back up the coaching rungs that preceded perhaps the crowning win of his career. “Sometimes you take different paths,” he said. “I wouldn’t trade those years for anything. I think it all leads you to right here.” And then he exited the arena, onward.